Because of media coverage, access to the computer and a desire to be healthier, many people are becoming smarter and aware of the damage that trans fats, high fructose corn syrup and white flour/sugar do to your body. But there are less obvious foods that don’t get the attention that these do that can be just as or almost as damaging to your health. Education is key. You won’t eliminate from your diet foods that are dangerous if you are not aware of what they are and why they are dangerous. Let’s cover some less obvious foods that are dangerous to your diet, accelerate rather than reverse the aging process and don’t get the press that high fructose corn syrup, trans fats and white flour get. Processed protein sources: Processed protein sources are yet another harmful food that far too many people include in their diets on a day to day basis. They are made from scrap meats such as hot dogs…they are not quality protein sources and should never be considered as such. Sausage, bacon, pepperoni, and deli meats all fall into this category. They do not provide the kind of nutrition that helps your body out. Your body requires foods in their natural state and none of these are. They have added nitrates, high levels of sodium and are loaded with saturated fat. Alcohol: Although studies indicate that red wine can actually be good for your health it’s not the alcohol that’s doing any favors for you…it’s the grapes that were used to make the wine that provides the health benefits. Your body considers alcohol a toxin to your system and as soon as you consume it, all the other processes going on in the body basically stop until the alcohol is removed. That includes fat burning. Next to fats which contain 9 calories per gram, alcohol contains 7 calories per gram making it the second most calorie dense item you can consume. So, if you consume alcohol on regular basis, you can expect to gain some serious weight. Mix it with other things in cocktails or blended beverages and you’ve added more calories. Alcohol also causes dehydration in the body which increase the formation of fine lines and wrinkles causing you to look far less attractive. Furthermore, alcohol increases your risk of cancer when consumed in high varieties so you must keep that in mind. Fat-free foods: Because we’ve been conditioned to believe that if it’s fat free it’s healthy and ok to eat these foods are very problematic. Fat free by nature such as fruits and veggies are always good but if nature has not created it, you need to avoid it. 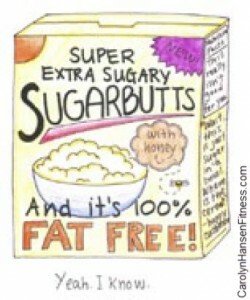 Anything that is labeled fat free has been made that way. However, what you need to be aware of is that the foods that you see in the supermarket are often simply the code word for “sugar laden” so pay close attention to labels. If it’s a long list of ingredients, you can be certain it’s not a healthy fat free food. Fat free does not mean sugar free and if you are eating foods high in sugar content…even if they are fat free, you are doing harm to your body. Calories matter and every excess one contributes to weight gain. Truth is, if the fat free foods you choose are high in sugar or contain artificial sweeteners, you may actually do more harm than good concerning health and aging and would be better off choosing the regular full fat variety. Deep fried foods: These foods are incredibly high in calories as well as unwanted fats. They can also contain added sugars depending on the type of deep fried foods you eat (think deep fried desserts). Additionally, deep fried foods often times contain trans fats…the number one dangerous food for your health. With so many healthy foods available these days, there is no reason to turn to deep fried foods. French fries and potato chips are not your friend! Since life is really not black and white, if you want to enjoy a glass of wine with your friends on occasion or possibly indulge in something deep fried once in a great while, your life is not going to fall apart. Enjoy these things on rare occasions…that’s the key. When you begin reaching for them, simply remind yourself of the damage they are doing for your health and aging process. That should be enough to make you step back. It’s time you became smart and knowledgeable about your diet and know what helps and what doesn’t.